the daily be: do: sparkle on. on saturday night my friend, sarah, threw a party to celebrate her birthday. she always throws the best parties--great music, decor, and there's always a theme. this year it was glitter!!! hours were spent sparkling up the place and i'm pretty sure they'll be finding glitter there for years to come. it was a little more challenging for the boys to dress for the theme, but some of them got pretty creative. our friend reese actually made a necklace out of the soundtrack to mariah carey's cinematic debut, glitter. hilarious. the girls, on the other hand, all looked fabulous and sparkly! despite a little drama with the building manager, it was a fantastic party. 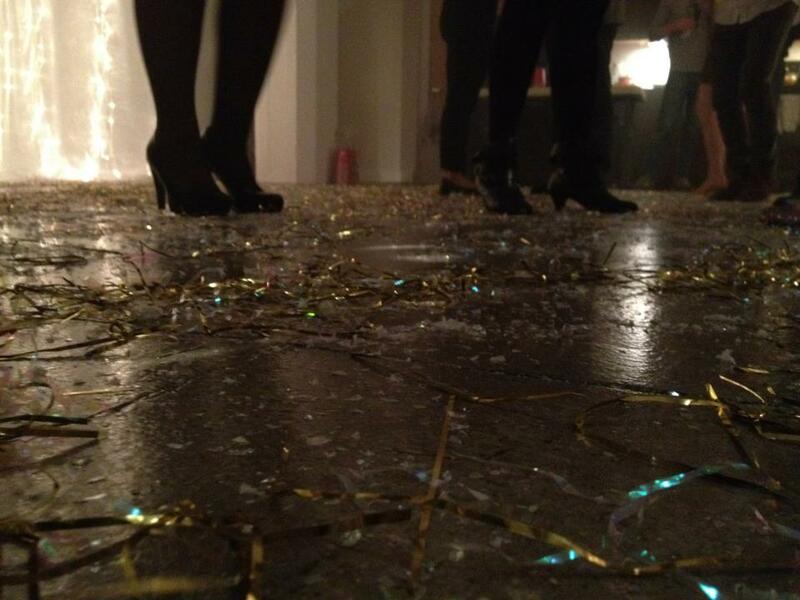 everyone had a blast and we danced our glittery butts off. four days later and i'm still finding glitter in my eyelashes, but that's to be expected. *and if you don't, just ask. Your face looks flawless in the picture with your glitter beard friend! What foundation/powder/blush do you use? !